The Preschool at All Saints blends many philosophies, teaching and learning styles, and curricula to best suit the needs of all children. All experiences are rooted in our Catholic faith, which is the center of our program. Our families and children are respected and our program is delivered in a completely developmentally appropriate manner that allows children to feel empowered and capable. We use the Georgia Early Learning Standards continuum of skills, behaviors and concepts that children develop throughout this time of life as a framework for learning. Our staff has continuing education in all developmental areas; including the philosophies of Reggio Emilia Schools, Handwriting without Tears, Phonemic Awareness, STEM education in the early years, and the Catechesis of the Good Shepherd and many more. We are supported, guided, and reviewed by the Archdiocese of Atlanta Office of Early Childhood Programs. PAS holds membership in the National Association of the Education of Young, Georgia Preschool Association, and the Southern Early Childhood Association. Our religious program is offered in such a way as to develop the precious spiritual potential present in every child: the capacity to love and be loved. We blend aspects of the Catechesis of the Good Shepherd where children learn about our Catholic faith in a hands-on exploration of the parts of the church, scripture, and sacraments. We listen and reflect with the children about God, Mary, the Saints and the weekly Gospel in the classrooms and the Atrium. Children have weekly small group time in the Atrium. The Atrium is a beautiful space for religious life, for community and worship – not a classroom. Our program is based on the scripture The Fruit of the Spirit. “But the fruit of the Spirit is love, joy, peace, patience, kindness, goodness, faithfulness, gentleness and self-control.” Galations 5:22. We focus on one of these virtues each month to instill a loving and Christ-like spirit in the children and to create a virtuous environment. The children lead our monthly chapel services, empowering them and involving them as valued participants in sharing God’s Word through prayer, song, and service to one another. We believe that all children have preparedness, potential, curiosity, and interest in engaging in social interaction, establishing relationships, constructing their learning, and negotiating with everything the environment brings to them. Teachers are deeply aware of each child’s potential and construct all their work and the environment of the children’s experience to respond appropriately. Each child is curious, wondrous about learning, filled with potential, possesses many talents, skills and abilities, and sees joy in all things possible. The children and their work are celebrated to encourage their self-worth and the value that they add to our school. Our classrooms look a bit different than many preschools. The school environment conveys many messages, of which, the most immediate is this is a place where adults have thought about the quality and instructive power about space. The layout of physical space, in addition to welcoming whoever enters the schools, fosters encounters, communication, and relationships. The arrangement of structures, objects, and activities encourages choices, problem-solving, and discoveries in the process of learning. The spaces are intended to be beautiful by conveying a message about children and teachers engaged together in the pleasure of learning. There is attention to detail everywhere: in the color of the walls, the shape of the furniture, the arrangement of simple objects on shelves and tables. Light from the windows and doors shines through transparent collages and weavings made by children. But the environment is not just beautiful — it is highly personal. The space is full of children’s work. Everywhere there are paintings, drawings, paper sculptures, wire constructions, transparent collages coloring the light, and mobiles moving gently overhead. It turns up even in unexpected spaces like stairways and bathrooms. The reflections of the teachers, the photographs of the children, and their dialogues are part of the displays to help the viewer understand the process of children’s thoughts and explorations. It is about making children’s thinking visible. The work thoughtfully selected by the teachers, literally surround the people in the school. Transcriptions of children’s remarks and discussions, photographs of their activity, and representations of their thinking and learning using many media are carefully arranged by the teachers to document the work and the process of learning. This documentation has several functions. Among these are to make parents aware of their children’s experience and maintain their involvement; to allow teachers to understand children better and to evaluate the teachers’ own work, thus promoting their professional growth; to facilitate communication and exchange of ideas among educators; to make children aware that their effort is valued; and to create an archive that traces the history of the school and the pleasure of learning by many children and their teachers. Class and school websites are also utilized to beautifully share and archive how children spend their days at All Saints. Although we base our curriculum on the Georgia Early Learning Standards, we allow the interests and needs of the children to lead the way. Teachers express general goals and make hypothesis about what direction activities and projects might take; they make appropriate preparations using the inquiry process. Then, after observing children in action, they compare, discuss, and interpret together their observations and make choices that they share with the children about what to offer and how to sustain the children in their exploration and learning. In fact, the curriculum emerges in the process of each activity or project and is flexibly adjusted accordingly through this continuous dialogue among teachers and with the interests, needs, strengths and weakness of each child. The teachers add provocations each day, with an open-ended outcome to allow the children to think, problem-solve and create their very own outcomes, not something predetermined by the teacher. Projects provide the backbone of the children and teachers’ learning experiences. They are based on the strong conviction that learning by doing is of great importance and that to discuss in groups and to revisit ideas and experiences is the premier way of gaining better understanding and learning. Ideas for projects originate in the continuum of the experience of children and teachers as they construct knowledge together. Projects can last from a few days to several months. They may start either from a chance event, an idea or a problem posed by one or more children, or an experience initiated directly by teachers. 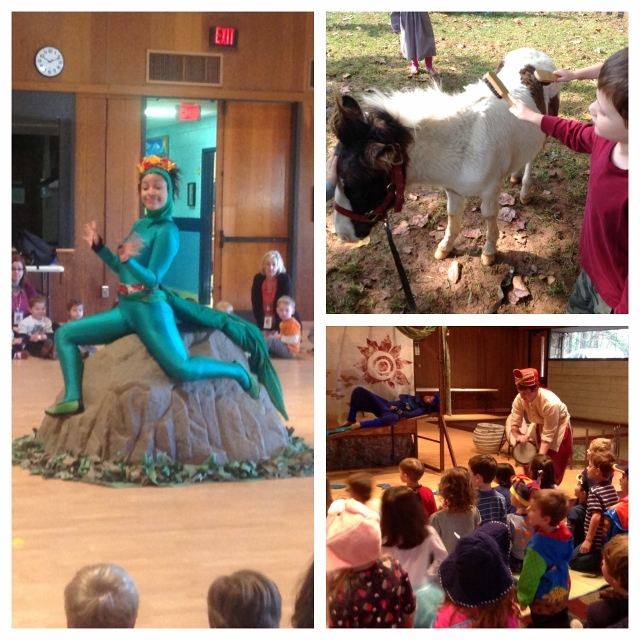 Each month, we have various special events or programs as enrichment supplements to our curriculum. The children encounter many hands-on experiences through these programs. Some of these include visits from the Fire Fighters, Dunwoody Police Department, Petting Zoo, and the amazing Alliance Theatre for the Very Young.